Berlin, fashion, magazine articles & new corset course!! Finally I have moved back to Berlin after living in Italy for almost a year! The experience of Bella Italia was wonderful and managed to travel quite a lot around the country and soak in as much of the art, architecture and culture as possible. I have to say that the Fashion, especially in Rome was a lot different to the fashion in Berlin (as I am sure everyone is aware of!) Everything here is so much more relaxed, with people’s attitudes and the way they want to represent themselves by their clothes and hair styles. In Italy I found at times people would stop with mouths wide open, staring and pointing at me because of my pink hair and way I dress but in Berlin I am just one among the many individuals who come to Berlin to get involved in this thriving city! I have to say…I am happy to be home! Above is a photograph of the 5 dresses that I made for Atelier Pietro Longhi…they took me a long time to complete as there were a lot of small details and I had to work on 5 all in one go, but I finished them! 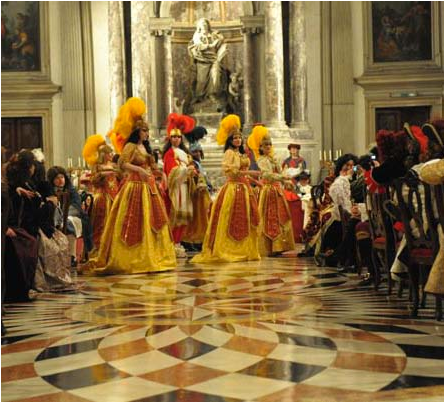 I am only just seeing the image for the first time now and it is from a performance at a masked ball in Venice last February. I recently had an article written about my work in a Berlin magazine called Exberliner by journalist Jessica Saltz, which I was very happy with! It is the first article written about my label Miss Moss. 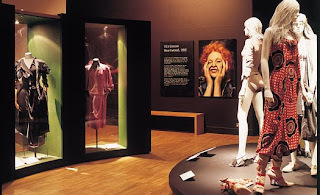 I have been doing some more research on Vivienne Westwood as I visited London a few months ago and ventured into a regular haunt for me when I am in “The old smoke”…The Victoria and Albert museum. What I love about Vivienne Westwood’s work is that she is so inspired by historical costume and tailoring but she came up with a completely new fashion “Punk” which paved the way for her fantastic career in fashion! To come up with an new fabulous, unique idea is hard but I believe if you have the right creativeness in your spirt you can be your own pioneer! She was also the first to bring to corset as “outer wear”. Usually when we think of the corset in the 80’s or 90’s Jean Paul Gautier’s corset for Madonna’s Blonde Ambition tour springs to mind but it was actually Viv who revived this restrictive piece from the bottom of the dusty corners in your Grandmothers wardrobe and gave it a new life. I have a new corset course planned for Saturday 14th August and will last for 6 saturdays, 10am-1pm each session…but unfortunately I think this will be the last one for a while. Now I want to focus on building up my label and try and find more work working within costume design for theatre, television and film. However I am sure I will run another one at some point but I now have other projects I am working on that I am hoping will take off very soon! Also have a photo shoot booked for this weekend so I can finally get my catalogue of work up online! I will keep my blog updated! !